Of today's comic - yes, it is a parody of a parody. 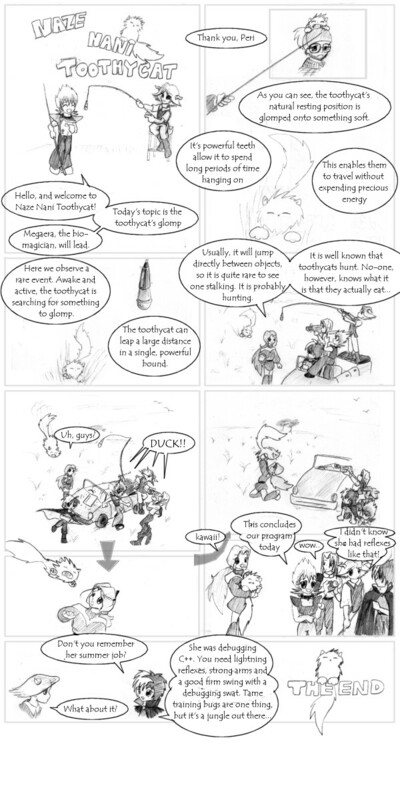 A long time ago, Megatokyo did a strip called Naze Nani Megatokyo ('The How and Why of Megatokyo'). It in turn is a parody of some of the episodes of Martian Successor Nadesico, which were called 'Naze Nani Nadesico' ('the How and Why of Nadesico'). Piro explains it well in the description below the strip in the link. Anyway, Moonshadow and I have seen Nadesico, but only after we read the Megatokyo spoof.